On New Year's Day we published Teun Van de Steeg's article, billed here as Tempo Calculated - Teun Van de Steeg finds evidence of a missing link in our perception of music. If you missed this, please read it now before continuing with what I have to say, because the most important thing here is what you, the reader, think. One of Teun Van de Steeg's reasons for publishing his article in English was to promote some discussion around this subject, and my hope is that his article will achieve this. Van de Steeg has written a book (in Dutch) on this subject, Uitgerekend Muziek (Music Tempo Calculated, 2012, Uitgeverij Boekscout, Soest, Holland, ISBN 978-94-6206-007-4). I have read the article published here in English, but not the book. I understand that the article is based on material from the book. To summarise what I have to say here, I think that there are some very interesting ideas in Tempo Calculated, and that the statement in Van de Steeg's conclusion, that music and nature are very closely linked, and that understanding this makes musical performance easier to understand, is true. But my feeling is that linking movement in music so strongly to the concepts of distance, acceleration and deceleration in such a mathematical way can be a bit limiting, which I'll try to explain more fully later. Basic tempo itself ... it's normally the performer's responsibility to choose and set the basic tempo, and this can (and usually does) have a huge effect on the performance. Often the performance will only be successful within a narrow range of speeds, but this is still a presentation issue. Timbre - often there will be performance choices involving the selection of instruments, playing style on the instrument selected, where this hasn't been written in the score, and the use of mutes etc. An obvious example is in choosing registration on a church organ. The wrong stop or selection can prevent the music's message from being communicated effectively. Acoustics and spatial positioning of musicians - it's often the performer's choice whether to use a venue with a long or short acoustic, and whether or not to use microphones, amplification etc. Physical positioning of performers within the performing space can also make a big difference to communication of the message in the music. Obeying (or not) the printed instructions. Mistakes in performance, plus various kinds of 'interpretative' disobeying of printed instructions, such as ignoring repeated sections, all have an effect on the success of the performance. 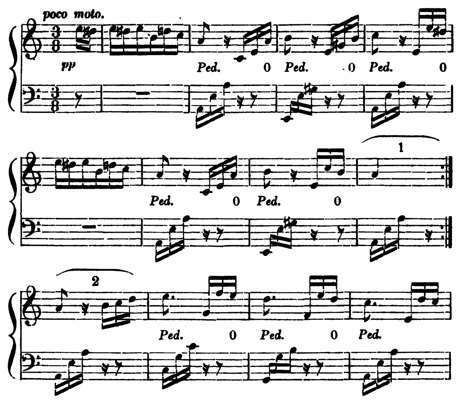 Delivery of language in spoken music - whether or not in translation, whether the words can be heard, and the vocal emphasis placed on particular words. Noises off - random or otherwise ... for example birdsong or traffic noise outside of the recital hall, the clinking of glasses as the catering staff prepare for the concert interval, or noises from the heating system. Depending on context, these things can be inaudible/un-noticeable, or can take over and change or spoil the music. Non-musical, usually visual impressions communicated to the audience via lighting, behaviour of performers on stage, conductors' gestures etc. Although not specifically 'musical', these things often communicate as much as the sound, especially to members of the audience more sensitive to visual rather than aural stimuli. My point here is that real life is almost always more complex than the models we often choose to represent it. All art, in general, and music in particular, tends to reflect real life in its various complexities, exceptions and peculiarities. I'm sure that, when reading this, enquiring musical minds will be able to add further to this list of performing characteristics. In the Music and convention section of Tempo Calculated, Teun Van de Steeg asks the question 'Is there a perfect performance in our world of imperfection?' He cites ten different performances of Beethoven's Für Elise and asks how we can determine which of the ten is 'the right one', 'appropriate' or 'perfect'? I find this a little disturbing, as there seems no notion here that alternatives are possible, that they can be equally successful, and that interpretation can be a matter of personal preference. Yes, it's true that no performance is perfect, but should we be judging performance in terms of 'good' and 'bad', on just one linear scale? One of the fascinations is that performances are all different, and bring out different aspects of the music, often equally relevant, and that music is multi-dimensional and has different effects on different listeners. In the next section, Music and notation, yes, I agree wholeheartedly that there are various shortcomings in conventional Western musical notation - it's a guide to performance only. 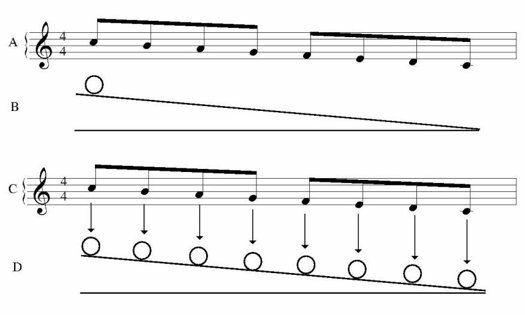 Well-typeset music (with more regard for clarity than saving paper) can make length relationships between notes much clearer, and the opposite is possible too. Movement in music has nothing to do with musical feeling but simply an understanding of physics. I think that this statement can be a little limiting. For example, I remember once hearing a piece of contemporary music which conjured up, in my imagination, the feeling of a large cube, spinning through space. I definitely imagined the sense of rotation, as well as linear movement, and that the object had flat sides ... that it wasn't a round, planet-type object. And I use the word 'feeling' because the 'image' wasn't entirely visual ... it also contained an element of the feeling of rotation. Can there be a scientific explanation for this kind of communication? The answer is not immediately clear. Many of our responses to music are generated from the brain's previous experience. I mention this because, in several places in this article, I feel that the ideas are being restrained to a particular kind of thinking. In fact, only one object is moving, for instance a marble, which is depicted in 8 different places. Here I feel quite strongly that my imagination is being limited. Why must the music represent one marble, moving? Why can it not also represent eight stationary marbles, either in a row, or in a circle, or any other formation? Why can't the descending notes represent the size or colour of each marble, or how quickly it is spinning? And isn't it dangerous to assume a very specific visual image for something as nebulous as music? Why must we connect the notes with physical objects at all? Optically it looks as if four semiquavers cover the same distance as one crotchet, but we realized this was not the case. A semiquaver moves four times faster than a crotchet and because of this covers four times the distance. Therefore it is equal to eight semiquavers. Why eight? If it were four or sixteen, I could understand. Please help me to understand this section better. Before I finish, please do give us some feedback, either on Teun Van de Steeg's original article (or on his book, if you read Dutch), or on what I've written here. Nevertheless, I am really convinced that only the physical approach is the appropriate one for understanding a musical performance. How can we be sure that this isn't limiting our musical responses to those connected with the physical objects around us, and preventing our minds and hearts from soaring with the composer's dreams?